Crown of England (#99115) (1891-1894), 297-foot British-built steel and iron cargo steamship. While en route from San Diego to British Columbia under the command of Captain John Hamilton, she ran aground on the south side of Santa Rosa Island in early November 1894 in the vicinity of Ford Point. The tug, Fearless, came to her aid, and the California Iron and Wrecking Company salvaged much of her equipment and engines which scattered for quite a distance. The main engines, steam hoists, steering gear, anchors, chains and other materials from her wreck were salvaged. Remnants of the 1894 salvage operation can still be found near the wreck site, including a donkey engine. The site is known as Wreck Canyon. 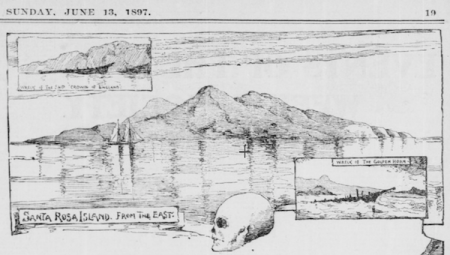 November 22, 1894 [LAT/SB]: “Loss of the steamer Crown of England. The court of Inquiry exonerates the captain and crew from all blame. The only testimony introduced before the court of inquiry sitting at Santa Monica on Wednesday to conclude its investigations into the loss of the steamer Crown of England early on the morning of November 7, was the deposition of E. O. Parsons, second officer of the passenger steamer Corona, which plies between San Francisco and San Diego… The facts of the vessel’s size, build, officering, voyage and loss are recited, including the facts found from the published evidence with regard to the fog, log reckoning and change of course, recites the erratic and unaccounted-for currents… particularly in the vicinity of the Channel Islands…"
Wreck Canyon on the south side of Santa Rosa Island is named after the 1894 wreck of the British ship. A large piece of machinery marks the spot from where she was salvaged. [Jones 1901: 206]. This page was last edited on 10 March 2017, at 08:23.